Transcript And Audio: Obama-Romney 2nd Presidential Debate Transcript and audio of the second debate between President Obama and Republican nominee Mitt Romney. President Obama and Republican nominee Mitt Romney shake hands before their debate Tuesday in Hempstead, N.Y.
Q: Mr. President, Governor Romney, as a 20-year-old college student, all I hear from professors, neighbors and others is that when I graduate, I will have little chance to get employment. Can — what can you say to reassure me, but more importantly my parents, that I will be able to sufficiently support myself after I graduate? MITT ROMNEY: Thank you, Jeremy. I appreciate your — your question, and — and thank you for being here this evening. And to all of those from Nassau County here that have come, thank you for your time. Thank you to Hofstra University and to Candy Crowley for organizing and leading this — this event. Thank you, Mr. President, also for being part of this — this debate. Yours question — your question is one that's being asked by college kids all over this country. I was in Pennsylvania with someone who'd just graduated. This was in Philadelphia, and she said, I — I — I got my degree. I can't find a job. I've got three part-time jobs. They're just barely enough to pay for my food and pay for an apartment. I can't begin to pay back my student loans. So what we have to do is two things: we have to make sure that we make it easier for kids to afford college and also make sure that when they get out of college, there's a job. When I was governor of Massachusetts, to get a high school degree, you had to pass an exam. If you graduated in the top quarter of your class, we gave you a John and Abigail Adams Scholarship, four years tuition-free to the college of your choice in Massachusetts. It's a public institution. I want to make sure we keep our Pell — Pell Grant program growing. We're also going to have our loan program so that people are able to afford school. But the key thing is to make sure you can get a job when you get out of school. And what's happened over the last four years has been very, very hard for America's young people. I want you to be able to get a job. I know what it takes to get this economy going. With half of college kids graduating this year without a college — or excuse me, without a job and without a college-level job, that's just unacceptable. And likewise, you got more and more debt on your back. So more debt and less jobs. I'm going to change that. I know what it takes to create good jobs again. I know what it takes to make sure that you have the kind of opportunity you deserve. And kids across this country are going to recognize we're bringing back an economy. It's not going to be like the last four years. The middle class has been crushed over the last four years, and jobs have been too scarce. I know what it takes to bring them back, and I'm going to do that and make sure when you graduate — when do you graduate? MR. ROMNEY: 2014. When you come out in 2014 — I presume I'm going to be president — I'm going to make sure you get a job. (Chuckles.) Thanks, Jeremy. Yeah, you bet. We've got to reduce our deficit, but we've got to do it in a balanced way — asking the wealthy to pay a little bit more, along with cuts, so that we can invest in education like yours. And let's take the money that we've been spending on war over the last decade to rebuild America — roads, bridges, schools. If we do those things, not only is your future going to be bright, but America's future's going to be bright as well. Just quickly, what can you do — we're looking at a situation where 40 percent of the unemployed have been unemployed for six months or more. They don't have the two years that Jeremy has. What about those long- term unemployed who need a job right now? The president's policies have been exercised over the last four years, and they haven't put Americans back to work. We have fewer people working today than we had when the president took office. If the — the unemployment rate was 7.8 percent when he took office. It's 7.8 percent now. But if you calculated that unemployment rate taking back the people who dropped out of the workforce, it would be 10.7 percent. We have not made the progress we need to make to put people back to work. And one thing that the — the president said which I want to make sure that we understand — he — he said that I said we should take Detroit bankrupt, and — and that's right. My plan was to have the company go through bankruptcy like 7-Eleven did and Macy's and — and — and Continental Airlines and come out stronger. And — and I know he keeps saying, you wanted to take Detroit bankrupt. Well, the president took Detroit bankrupt. You took General Motors bankrupt. You took Chrysler bankrupt. So when you say that I wanted to take the auto industry bankrupt, you actually did. And — and I think it's important to know that that was a process that was necessary to get those companies back on their feet, so they could start hiring more people. That was precisely what I recommend and ultimately what happened. MS. CROWLEY: Let me — let me give the president a chance. Go ahead. And that — don't take my word for it; take the executives at GM and Chrysler, some of whom are Republicans, may even support Governor Romney. But they'll tell you his prescription wasn't going to work. MR. ROMNEY: That — that Detroit — that Detroit answer — that Detroit answer and the rest of the answer — way off the mark. MS. CROWLEY: I — OK. We'll — you certainly will have lots of time here coming up. I — because I want to move you on to something that — sort of connected to cars here, and go over — and we want to get a question from Philip Tricolla. Now, I want to build on that. And that means, yes, we still continue to open up new areas for drilling. We continue to make a — it a priority for us to go after natural gas. We've got potentially 600,000 jobs and a hundred years' worth of energy right beneath our feet with natural gas. And we can do it in an environmentally sound way. But we've also got to continue to figure out how we have efficient energy, because ultimately that's how we're going to reduce demand, and that's what's going to keep gas prices lower. Now, Governor Romney will say he's got an all-of-the-above plan, but basically his plan is to let the oil companies write the energy policies. So he's got the oil and gas part, but he doesn't have the clean energy part. And if we are only thinking about tomorrow or the next day and not thinking about 10 years from now, we're not going to control our own economic future, because China, Germany — they're making these investments. And I'm not going to cede those jobs of the future to those countries. I expect those new energy sources to be built right here in the United States. Look, I want to make sure we use our oil, our coal, our gas, our nuclear, our renewables. I believe very much in our renewable capabilities — ethanol, wind, solar will be an important part of our energy mix. But what we don't need is to have the president keeping us from taking advantage of oil, coal and gas. This has not been Mr. Oil or Mr. Gas or Mr. Coal. Talk to the people that are working in those industries. I was in coal country. People grabbed my arms and say, please, save my job. The head of the EPA said, you can't build a coal plant. You'll virtually — it's virtually impossible, given our regulations. When the president ran for office, he said, if you build a coal plant, you can go ahead, but you'll go bankrupt. That's not the right course for America. Let's take advantage of the energy resources we have, as well as the energy sources for the future. And if we do that, if we do what I am planning on doing, which is getting us energy-independent, North American energy independence within eight years, you're going to see manufacturing come back jobs because our energy is low-cost. And very little of what Governor Romney just said is true. We've opened up public lands. We're actually drilling more on public lands than in the previous administration. And my — the previous president was an oilman. And natural gas isn't just appearing magically; we're encouraging it and working with the industry. And when I hear Governor Romney say he's a big coal guy — and keep in mind when — Governor, when you were governor of Massachusetts, you stood in front of a coal plant and pointed at it and said, this plant kills, and took great pride in shutting it down. And now suddenly you're a big champion of coal. MR. ROMNEY: — and the question was how much did you cut them by? PRESIDENT OBAMA: — I'm happy to answer the question. PRESIDENT OBAMA: — those leases, and we are now reletting them so that we can actually make a profit. MR. ROMNEY: And — and — and production on private — on government lands is down. MR. ROMNEY: — and gas on federal lands and in federal waters. And coal — coal production is not up, coal jobs are not up. I was just at a coal facility where some 1,200 people lost their jobs. The right course for America is to have a true all-of-the-above policy. I don't think anyone really believes that you're a person who's going to be pushing for oil and gas and coal. PRESIDENT OBAMA: Well, Governor, if — if you're asking me a question, I'm going to answer it. MR. ROMNEY: My — and the answer is I don't believe people think that's the case, because I — I'm — that wasn't a question. MR. ROMNEY: That was a statement. I don't think — (chuckles) — the American people believe that. I will fight for oil, coal and natural gas. And the proof — the proof of whether a strategy is working or not is what the price is that you're paying at the pump. If you're paying less than you paid a year or two ago, why, then the strategy is working. But you're paying more. When the president took office, the price of gasoline here in Nassau County was about a buck eighty-six a gallon. Now it's four bucks a gallon. Price of electricity is up. What I want to do is to create an economy that is strong and at the same time produce energy. And with respect to this pipeline that Governor Romney keeps on talking about, we've — we've built enough pipeline to wrap around the entire Earth once. So I'm all for pipelines; I'm all for oil production. What I'm not for is us ignoring the other half of the quotation. So for example, on wind energy, when Governor Romney says these are imaginary jobs, when you've got thousands of people right now in Iowa, right now in Colorado who are working, creating wind power, with good- paying manufacturing jobs, and the Republican senator in that — in Iowa is all for it, providing tax credits to help this work and Governor Romney says, I'm opposed, I'd get rid of it, that's not an energy strategy for the future. And we need to win that future, and I intend to win it as president of the United States. MR. ROMNEY: No, he — he gets the first — he actually got — he actually got the first question. So I get the last question — last answer on that one. MS. CROWLEY: If — actually, in the follow-up. It doesn't quite work like that. MR. ROMNEY: Candy, Candy, Candy, I don't have a policy of — of stopping wind jobs in Iowa and that — they're not phantom jobs. They're real jobs. MS. CROWLEY: So you're — OK. Thank you, Governor. MR. ROMNEY: — that taking advantage of our energy resources will bring back manufacturing to America. We're going to get through a very aggressive energy policy, 3.5 million more jobs in this country. It's critical to our future. Governor, this question is for you. It comes from Mary Pollano — Follano. Sorry. Q: Governor Romney, you have stated that if you're elected president, you would plan to reduce the tax rates for all the tax brackets and that you would work with the Congress to eliminate some deductions in order to make up for the loss in revenue. Concerning the — these various deductions — the mortgage deduction, the charitable deductions, the child tax credit and also the — oh, what's that other credit? MR. ROMNEY: Thank you very much. And — and let me tell you, you — you're absolutely right about part of that, which is I want to bring the rates down, I want to simplify the tax code, and I want to get middle-income taxpayers to have lower taxes. And — and the reason I want middle-income taxpayers to have lower taxes is because middle-income taxpayers have been buried over the past four years. You've seen, as middle-income people in this country, incomes go down $4,300 a family even as gasoline prices have gone up $2,000. Health insurance premiums — up $2,500. Food prices up, utility prices up. The middle-income families in America have been crushed over the last four years. So I want to get some relief to middle-income families. That's part — that's part one. And so in terms of bringing down deductions, one way of doing that would be to say everybody gets — I'll pick a number — $25,000 of deductions and credits. And you can decide which ones to use, your home mortgage interest deduction, charity, child tax credit and so forth. You can use those as part of filling that bucket, if you will, of deductions. But your rate comes down, and the burden also comes down on you for one more reason. Why am I lowering taxes on the middle class? Because under the last four years, they've been buried, and I want to help people in the middle class. And I will not — I will not under any circumstances — reduce the share that's being paid by the highest-income taxpayers, and I will not under any circumstances increase taxes on the middle class. The president's spending, the president's borrowing will cost this nation to have to raise taxes on the American people, not just at the high end. PRESIDENT OBAMA: My philosophy on taxes has been simple, and that is, I want to give middle-class families, and folks who are striving to get in the middle class, some relief, because they have been hit hard over the last decade, over the last 15, over the last 20 years. So four years ago I stood on a stage just like this one — actually, it was a town hall — and I said I would cut taxes for middle-class families, and that's what I've done by $3,600. I said I would cut taxes for small businesses, who are the drivers and engines of growth, and we've cut them 18 times. And I want to continue those tax cuts for middle-class families and for small businesses. So we just have a different theory. And when Governor Romney stands here after a year of campaigning, when during a Republican primary, he stood onstage and said, I'm going to give tax cuts — he didn't say tax rate cuts; he said tax cuts — to everybody, including the top 1 percent, you should believe him, because that's been his history. MS. CROWLEY: Governor, let me ask the president something about what you just said. The governor says that he is not going to allow the top 5 percent — I believe is what he said — to have a tax cut, that it will all even out, that what he wants to do is give that tax cut to the middle class. Settled? PRESIDENT OBAMA: No, it's not settled. (Chuckles.) Look, the cost of lowering rates for everybody across the board 20 percent, along with what he also wants to do in terms of eliminating the estate tax, along what he wants to do in terms of corporates changes in the tax code — it costs about $5 trillion. Governor Romney then also wants to spend $2 trillion on additional military programs, even though the military's not asking for them. That's $7 trillion. He also wants to continue the Bush tax cuts for the wealthiest Americans. That's another trillion dollars. That's $8 trillion. Now, what he says is he's going to make sure that this doesn't add to the deficit, and he's going to cut middle-class taxes. But when he's asked, how are you going to do it, which deductions, which loopholes are you going to close, he can't tell you. The — the fact that he only has to pay 14 percent on his taxes when a lot of you are paying much higher — you know, he's already taken that off the board. Capital gains are going to continue to be at a low rate, so we — we're not going to get money that way. We haven't heard from the governor any specifics, beyond Big Bird and eliminating funding for Planned Parenthood, in terms of how he pays for that. And — and what's at stake here is one of two things. Either, Candy, this blows up the deficit — because keep in mind, this is just to pay for the additional spending that he's talking about, 7 (trillion dollars), $8 trillion. That's before we even get to the deficit we already have. Or alternatively, it's got to be paid for not only by closing deductions for wealthy individuals. That will pay for about 4 percent reduction in tax rates. You're going to be paying for it. You'll lose some deductions. And you can't buy this sales pitch. Nobody who's looked at it that's serious actually believes it adds up. MS. CROWLEY: Mr. President, let me get — let me get the governor in on this. MR. ROMNEY: Well, of course they add up. I was — I was someone who ran businesses for 25 years and balanced the budget. I ran the Olympics and balanced the budget. I ran the — the state of Massachusetts as a governor, to the extent any governor does, and balanced the budget all four years. When we're talking about math that doesn't add up, how about $4 trillion of deficits over the last four years, 5 trillion (dollars). That's math that doesn't add up. We have — we — we have a president talking about someone's plan in a way that's completely foreign to what my real plan is, and then we have his own record, which is we have four consecutive years where he said, when he was running for office, he could cut the deficit in half. Instead, he's doubled it. MR. ROMNEY: I'm — and I've told you — yeah. MS. CROWLEY: Mr. President, you're — we're keeping track, I promise you. And this is one of the reasons why one of the first — the first bill I signed was something called the Lilly Ledbetter bill. MR. ROMNEY: Thank you. And — important topic and one which I learned a great deal about, particularly as I was serving as governor of my state, because I had the — the chance to pull together a Cabinet and all the applicants seemed to be men. And I — and I went to my staff, and I said, how come all the people for these jobs are — are all men? They said, well, these are the people that have the qualifications. And I said, well, gosh, can't we — can't we find some — some women that are also qualified? And — and so we — we took a concerted effort to go out and find women who had backgrounds that could be qualified to become members of our cabinet. I went to a number of women's groups and said, can you help us find folks? And I brought us whole binders full of — of women. I was proud of the fact that after I staffed my cabinet and my senior staff that the University of New York in Albany did a survey of all 50 states and concluded that mine had more women in senior leadership positions than any other state in America. Now, one of the reasons I was able to get so many good women to be part of that team was because of our recruiting effort, but number two, because I recognized that if you're going to have women in the workforce, that sometimes they need to be more flexible. My chief of staff, for instance, had two kids that were still in school. She said, I can't be here until 7:00 or 8:00 at night. I need to be able to get home at 5:00 so I can be there for — making dinner for my kids and being with them when they get home from school. So we said, fine, let's have a flexible schedule so you can have hours that work for you. We're going to have to have employers in the new economy, in the economy I'm going to bring to play, that are going to be so anxious to get good workers they're going to be anxious to hire women. In the — in the last four years, women have lost 580,000 jobs. That's the net of what's happened in the last four years. We're still down 580,000 jobs. I mentioned 3 1/2 million women more now in poverty than four years ago. And I know what a working economy looks like. And an economy with 7.8 percent unemployment is not a real strong economy. An economy that — that — that has 23 million people looking for work is not a strong economy. An economy with — with 50 percent of kids graduating from college that can't find a job, or a college-level job — that's not what we have to have. MR. ROMNEY: I'm going to help women in America get — get good work by getting a stronger economy and by supporting women in the workforce. Now, there are some other issues that have a bearing on how women succeed in the workplace: for example, their health care. (Inaudible) — a major difference in this campaign is that Governor Romney feels comfortable having politicians in Washington decide the health care choices that women are making. I think that's a mistake. In my health care bill, I said insurance companies need to provide contraceptive coverage to everybody who is insured, because this is not just a — a health issue; it's an economic issue for women. It makes a difference. This is money out of that family's pocket. MS. CROWLEY: And let me tell you that the last part, there's — it's for the two of you to talk to one another, and it isn't quite as — (inaudible). But go ahead and use this two minutes any way you'd like to. The question is on the floor. MR. ROMNEY: I — I'd just note that I don't believe that bureaucrats in Washington should tell someone whether they can use contraceptives or not, and I don't believe employers should tell someone whether they could have contraceptive care or not. Every woman in America should have access to contraceptives. And — and the — and the president's statement of my policy is completely and totally wrong. MR. ROMNEY: Let me come back and — and — and answer your question. The — President Bush and I are different people, and these are different times. And that's why my five-point plan is so different than what he would have done. I mean, for instance, we can now, by virtue of new technology, actually get all the energy we need in North America without having to go to the — the Arabs or the Venezuelans or anyone else. That wasn't true in his time. That's why my policy starts with a very robust policy to get all that energy in North America, become energy-secure. And the thing I find most troubling about "Obamacare" — well, it's a long list, but one of the things I find most troubling is that when you go out and talk to small businesses and ask them what they think about it, they tell you it keeps them from hiring more people. But we have been digging our way out of policies that were misplaced and focused on the top doing very well and middle-class folks not doing well. And we've seen 30 consecutive — 31 consecutive months of job growth, 5.2 million new jobs created. And the plans that I talked about will create even more. But when Governor Romney says that he has very different economic plan, the centerpiece of his economic plan are tax cuts. That's what took us from surplus to deficit. When he talks about getting tough on China, keep in mind that Governor Romney invested in companies that were pioneers of outsourcing to China and is currently investing in countries — in — in companies that are building surveillance equipment for China to spy on its own folks. That's — Governor, you're the last person who's going to get tough on China. Now, does that mean you're not struggling? Absolutely not. A lot of us are. And that's why the plan that I put forward for manufacturing and education and reducing our deficit in a sensible way, using the savings from ending wars to rebuild America and putting people back to work, making sure that we are controlling our own energy, but not just the energy of today but also the energy of the future — all those things will make a difference. So the point is, the commitments I've made, I've kept. And those that I haven't been able to keep, it's not for lack of trying, and we're going to get it done in a second term. But you should pay attention to this campaign, because Governor Romney's made some commitments as well, and I suspect he'll keep those, too. You know, when members of the Republican Congress say, we're going to sign a no tax pledge so that we don't ask a dime from millionaires and billionaires to reduce our deficit so we can still invest in education and helping kids go to college, he said, me too. When they said, we're going to cut Planned Parenthood funding, he said, me too. When he said, we're going to repeal "Obamacare," first thing I'm going to do — despite the fact that it's the same health care plan that he passed in Massachusetts and is working well — he said, me too. That is not the kind of leadership that you need, but you should expect that those are promises he's going to keep. MR. ROMNEY: I think you know better. I — I think you know that these last four years haven't been so good as the president just described and that you don't feel like you're confident that the next four years are going to be much better either. I can tell you that if you were to elect President Obama, you know what you're going to get. You're going to get a repeat of the last four years. We just can't afford four more years like the last four years. He said that by now we'd have unemployment at 5.4 percent. The difference between where it is and 5.4 percent is 9 million Americans without work. I wasn't the one that said 5.4 percent. This was the president's plan — didn't get there. He said in his first year he'd put out an immigration plan that would deal with our immigration challenges — didn't even file it. He said that by now middle-income families would have a reduction in their health insurance premiums by $2,500 a year. It's gone up by 2,500 (dollars) a year. And if "Obamacare" is passed — or implemented — it's already been passed. If it's implemented fully, it'll be another 2,500 (dollars) on top. That's after losing 5 million jobs. The entire record is such that the unemployment has not been reduced in this country. The unemployment, the number of people who are still looking for work, is still 23 million Americans. There are more people in poverty — one out of six people in poverty. How about food stamps? When he took office, 32 million people were on food stamps; today 47 million people are on food stamps. How about the growth of the economy? It's growing more slowly this year than last year and more slowly last year than the year before. The — the president wants to do well; I understand. But the policies he's put in place, from "Obamacare" to Dodd-Frank to his tax policies to his regulatory policies — these policies combined have not led this economy take off and grow like it could have. You might say, well, you got an example of when it worked better? Yeah, in the Reagan recession, where unemployment hit 10.8 percent. Between that period — the end of that recession and equivalent period of time to today, Ronald Reagan's recovery created twice as many jobs as this president's recovery. Five million jobs doesn't even keep up with our population growth. And the only reason the unemployment rate seems a little lower today is because of all the people that have dropped out of the workforce. The president has tried, but his policies haven't worked. He's great as a — as a — a — a — as a speaker and — and describing his plans and his vision. That's wonderful, except we have a record to look at. And that record shows he just hasn't been able to cut the deficit, to put in place reforms for Medicare and Social Security to preserve them, to get us the rising incomes we — median incomes are down $4,300 a family, and 23 million Americans out of work. That's what this election is about. It's about who can get the middle class in this country a bright and prosperous future and assure our kids the kind of hope and optimism they deserve. Q: President — Romney, what do you plan on doing with immigrants without their green cards that are currently living here as productive members of society? MR. ROMNEY: Thank you, Lorraine. Did I get that right? Good. Thank you for your question. And let me step back and tell you what I'd like to do with our immigration policy broadly and include an answer to your — your question. I want our legal system to work better. I want it to be streamlined, I want it to be clearer. I don't think you have to — shouldn't have to hire a lawyer to figure out how to get into this country legally. I also think that we should give visas to people — green cards, rather, to people who graduate with skills that we need, people around the world with accredited degrees in — in science and math get a green card stapled to their diploma, come to the US of A. We should make sure that our legal system works. What I will do is I'll put in place an employment verification system and make sure that employers that hire people who have come here illegally are sanctioned for doing so. I won't put in place magnets for people coming here illegally, so for instance, I would not give driver's licenses to those that have come here illegally, as the — as the president would. The kids of — of those that came here illegally, those kids I think should have a pathway to become a — a permanent resident of the United States. Now, when the president ran for office, he said that he'd put in place, in his first year, a piece of legislation — he'd file a bill in his first year that would reform our — our immigration system, protect legal immigration, stop illegal immigration. He didn't do it. He had a Democrat House and Democrat Senate, supermajority in both houses. Why did he fail to even promote legislation that would have provided an answer for those that want to come here legally and for those that are here illegally today? That's a question I think the — the president will have a chance to answer right now. PRESIDENT OBAMA: Good. I look forward to it. Was — Lorena? Lorraine. We are a nation of immigrants. I mean, we're just a few miles away form Ellis Island. We all understand what this country has become because talent from all around the world wants to come here, people who are willing to take risks, people who want to build on their dreams and make sure their kids have an — even bigger dreams than they have. Now, Governor Romney just said that, you know, he wants to help those young people, too. But during the Republican primary, he said, I will veto the DREAM Act that would allow these young people to have access. His main strategy during the Republican primary was to say, we're going to encourage self-deportation, making life so miserable on folks that they'll leave. He called the Arizona law a model for the nation. Part of the Arizona law said that law enforcement officers could stop folks because they suspected maybe they looked like they might be undocumented workers and checked their papers. And you know what, if my daughter or yours looks to somebody like they're not a citizen, I don't want — I don't want to empower somebody like that. MS. CROWLEY: — the idea of self-deportation. MR. ROMNEY: Let — no, let — let me go back and speak to the points that the president made and — and let's get them correct. I did not say that the Arizona law was a model for the nation in that aspect. I said that the e-Verify portion of the Arizona law, which is — which is the portion of the law which says that employers could be able to determine whether someone is here illegally or not illegally — that that was a model for the nation. That's number one. Number two, I asked the president a question I think Hispanics and immigrants all over the nation have asked. He was asked this on Univision the other day. Why, when you said you'd file legislation in your first year, didn't you do it? And he didn't answer. He don't — he doesn't answer that question. He said the standard bearer wasn't for it. I — I'm glad you thought I was a standard bearer four years ago, but I wasn't. Four years ago you said in your first year you would file legislation. In his first year — (chuckles) — I was just getting or — I was licking my wounds from having been beaten by John McCain. All right? I was not the standard bearer. My — my view is that this president should have honored his promise to — to do as he said. Now let me mention one other thing, and that is, self-deportation says let it — let people make their own choice. What I was saying is, we're not going to round up 12 million people, undocumented, illegals, and take them out of the nation. Instead, let — make — people make their own choice. And if they — if they find that — that they can't get the benefits here that they want and they can't find the job they want, then they'll make a decision to go a place where — where they have better opportunities. But I'm not in favor of rounding up people and — and — and — and taking them out of this country. I am in favor, as the president has said, and I agree with him, which is that if people have committed crimes, we got to get them out of this country. MR. ROMNEY: I — I — you know, I'm still — Mr. President, I'm still speaking. MR. ROMNEY: Yeah. Just going to make a point. Any investments I have over the last eight years have been managed by a blind trust. And I understand they do include investments outside the United States, including in — in Chinese companies. Mr. President, have you looked at your pension? MS. CROWLEY: And we are way — we're sort of way off topic here, Governor Romney. We are completely off immigration. MR. ROMNEY: I came — I came back to what you spoke about before. MS. CROWLEY: And we were. 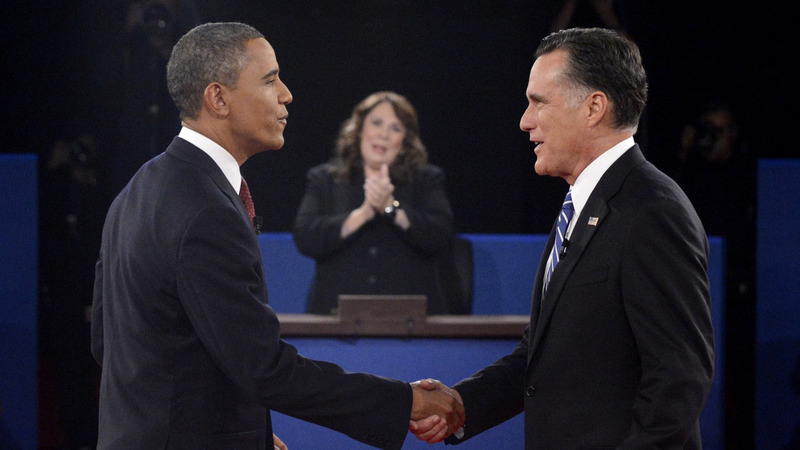 So quickly, Mr. President — if I could have you sit down, Governor Romney. Thank you. PRESIDENT OBAMA: I do want to make sure that we just understand something. Governor Romney says he wasn't referring to Arizona as a model for the nation. His top adviser on immigration is the guy who designed the Arizona law, the entirety of it — not E-Verify, the whole thing. That's his policy, and it's a bad policy. And it won't help us grow. Look, when we think about immigration, we have to understand there are folks all around the world who still see America as the land of promise. And they provide us energy, and they provide us innovation. And they start companies like Intel and Google, and we want to encourage that. Now, we've got to make sure that we do it in a smart way and a comprehensive way and we make the legal system better. But when we make this into a divisive political issue, and when we don't have bipartisan support — I can deliver, Governor, a whole bunch of Democrats to get comprehensive immigration reform done. PRESIDENT OBAMA: — serious about this issue at all. PRESIDENT OBAMA: I'm — I'm here. MS. CROWLEY: — I want you to talk to Kerry Ladka, who has a — wants to switch a topic for us. So as soon as we found out that the Benghazi consulate was being overrun, I was on the phone with my national security team, and I gave them three instructions. Number one, beef up our security and — and — and procedures not just in Libya but every embassy and consulate in the region. Number two, investigate exactly what happened, regardless of where the facts lead us, to make sure that folks are held accountable and it doesn't happen again. And number three, we are going to find out who did this, and we are going to hunt them down, because one of the things that I've said throughout my presidency is when folks mess with Americans, we go after them. And people — not everybody agrees with some of the decisions I've made. But when it comes to our national security, I mean what I say. I said I'd end the war in Libya — in Iraq, and I did. I said that we'd go after al-Qaida and bin Laden. We have. I said we'd transition out of Afghanistan and start making sure that Afghans are responsible for their own security. That's what I'm doing. MR. ROMNEY: Thank you, Kerry, for your question. It's an important one. And — and I — I think the president just said correctly that — that the buck does stop at his desk, and — and he takes responsibility for — for that — for that — the failure in providing those security resources, and those terrible things may well happen from time to time. I — I'm — I feel very deeply sympathetic for the families of those who lost loved ones. Today there's a memorial service for one of those that was lost in this tragedy. We — we think of their families and care for them deeply. There were other issues associated with this — with this tragedy. But I find more troubling than this that on — on the day following the assassination of the United States ambassador — the first time that's happened since 1979 — when we have four Americans killed there, when apparently we didn't know what happened, that the president the day after that happened flies to Las Vegas for a political fundraiser, then the next day to Colorado for another event, another political event, I think these — these actions taken by a president and a leader have symbolic significance, and perhaps even material significance, in that you'd hoped that during that time we could call in the people who were actually eyewitnesses. We've read their accounts now about what happened. It was very clear this was not a demonstration. This was an attack by terrorists. And this calls into question the president's whole policy in the Middle East. Look what's happening in Syria, in Egypt, now in Libya. Consider the distance between ourselves and Israel, where the president said that — that he was going to put daylight between us and Israel. We have Iran four years closer to a nuclear bomb. Syria — Syria's not just the tragedy of 30,000 civilians being killed by a military, but also a strategic — strategically significant player for America. The president's policies throughout the Middle East began with an apology tour and pursue a strategy of leading from behind, and this strategy is unraveling before our very eyes. MR. ROMNEY: Excuse me. The ambassador to the United Nations went on the Sunday television shows and — and spoke about how this was a spontaneous reaction. MS. CROWLEY: I know you — absolutely. But I want — I want to move you on. MS. CROWLEY: — figure out what was said and when. PRESIDENT OBAMA: — you know, all these wonderful folks are going to have a chance to get some — their questions answered. MS. CROWLEY: Because what I want to do, Mr. President — stand there for a second, because I want to introduce you to Nina Gonzales, who brought up a question that we hear a lot, both over the Internet and from this crowd. MR. ROMNEY: Yeah, I — I'm not in favor of new pieces of legislation on — on guns and — and taking guns away or — or making certain guns illegal. We of course don't want to have automatic weapons, and that's already illegal in this country to have automatic weapons. He mentioned good schools. I totally agree. We were able to drive our schools to be number one in the nation in my state, and I believe if we do a better job in education, we'll — we'll give people the — the hope and opportunity they deserve, and perhaps less violence from that. But let me mention another thing, and that is parents. We need moms and dads helping raise kids. Wherever possible, the — the benefit of having two parents in the home — and that's not always possible. A lot of great single moms, single dads. But gosh, to tell our kids that before they have babies, they ought to think about getting married to someone — that's a great idea because if there's a two-parent family, the prospect of living in poverty goes down dramatically. The opportunities that the child will — will be able to achieve increase dramatically. The — the greatest failure we've had with regards to gun violence, in some respects, is what is known as Fast and Furious, which was a program under this administration — and how it worked exactly, I think we don't know precisely — but where thousands of automatic and — and AK-47-type weapons were — were given to people that ultimately gave them to — to drug lords. They used those weapons against — against their own citizens and killed Americans with them. And this was a — this was a program of the government. For what purpose it was put in place, I can't imagine. But it's one of the great tragedies related to violence in our society which has occurred during this administration which I think the American people would like to understand fully. It's been investigated to a degree, but the administration has — has carried out executive privilege to prevent all the information from coming out. I'd like to understand who it was that did this, what the idea was behind it, why it led to the violence — thousands of guns going to Mexican drug lords. MR. ROMNEY: Well, Candy, actually, in my state, the pro-gun folks and the anti-gun folks came together and put together a piece of legislation, and it's referred to as a — as an assault weapon ban, but it had at the signing of the bill both the pro-gun and the anti- gun people came together, because it provided opportunities for both that both wanted. There were hunting opportunities, for instance, that hadn't previously been available and so forth. So it was a mutually agreed upon piece of legislation. That's what we need more of, Candy. What we have right now in Washington is a place that's — that's gridlocked. We haven't had — we haven't — we haven't — we haven't had the leadership in Washington to work on a bipartisan basis. PRESIDENT OBAMA: The — first of all, I think Governor Romney was for an assault weapons ban before he was against it. And he said that the reason he changed his mind was in part because he was seeking the endorsement of the National Rifle Association. And Candy, we haven't had a chance to talk about education much. But I think it is very important to understand that the reforms we put in place, working with 46 governors around the country, are seeing schools that are some of the ones that are the toughest for kids starting to succeed. We're starting to see gains in math and science. When it comes to community colleges, we are setting up programs, including with Nassau Community College, to retrain workers, including young people who may have dropped out of school but now are getting another chance — training them for the jobs that exist right now. And in fact, employers are looking for skilled workers, and so we're matching them up. Giving them access to higher education — as I said, we have made sure that millions of young people are able to get an education that they weren't able to get before. MS. CROWLEY: Mr. President, I have to — I have to move you along here. You said you wanted to hear these questions, and we need to do it here. PRESIDENT OBAMA: — and reduce our violence. One of the reasons for that is that people think it's more attractive, in some cases, to go offshore than to — than to stay here. We have made it less attractive for enterprises to stay here than to go offshore from time to time. Now, we're going to have to make sure that as we trade with other nations, that they play by the rules, and China hasn't. One of the reasons — or one of the ways they don't play by the rules is artificially holding down the value of their currency, because if they put their currency down low, that means their prices on their goods are low. And that makes them advantageous in the marketplace. We lose sales, and manufacturers here in the U.S. making the same products can't compete. China has been a currency manipulator for years and years and years. And the president has a regular opportunity to — to label them as a — as a currency manipulator but refuses to do so. On day one, I will label China a currency manipulator, which will allow me as president to be able to put in place, if necessary, tariffs where I believe that they are taking unfair advantage of our manufacturers. But let me — let me not just stop there. Don't forget: What's key to bringing back jobs here is not just finding someone else to punish — and — and I'm going to be strict with people who we trade with to make sure they — they follow the law and play by the rules — but it's also to make America the most attractive place in the world for businesses of all kinds. That's why I want to bring down the tax rates on small employers, big employers, so they want to be here. Canada's tax rate on companies is now 15 percent. Ours is 35 percent. So if you're starting a business, where would you rather start it? We have to be competitive if we're going to create more jobs here. Regulations have quadrupled. The rate of regulations quadrupled under this president. I've talked to small businesses across the country. They say we feel like we're under attack from our own government. I want to make sure that regulators see their job as encouraging small business — not crushing it. And there's no question but that "Obamacare" has been an extraordinary deterrent to enterprises of all kinds hiring people. My priority is making sure that we get more people hired. If we have more people hired, if we get back manufacturing jobs, if we get back all kinds of jobs into this country, then you're going to see rising incomes again. The reason incomes are down is because unemployment is so high. I know what it takes to get this to happen, and my plan will do that, and one part of it is to make sure that we keep China playing by the rules. Thanks. MR. ROMNEY: — is complete — is completely — is completely false. MS. CROWLEY: Let me go to the president here, because we really are running out of time. And the question is can we ever get — we can't get wages like that. It can't be sustained here. MS. CROWLEY: — but Governor Romney, I want to introduce you to Barry Green, because he's going to have the last question to you first. MR. ROMNEY: Thank you. And that's an opportunity for me, and I appreciate it. In the nature of a campaign, it seems that some campaigns are focused on attacking a person rather than prescribing their own future and the things they'd like to do. And in the course of that, I think the president's campaign has tried to characterize me as — as someone who — who is very different than who I am. I care about a hundred percent of the American people. I want a hundred percent of the American people to have a bright and prosperous future. I care about our kids. I understand what it takes to — to make a bright and prosperous future for America again. I — I spent my life in the private sector, not in government. I'm a guy who wants to help, with the experience I have, the American people. My — my — my passion probably flows from the fact that I believe in God, and I believe we're all children of the same God. I believe we have a responsibility to care for one another. I — I served as a missionary for my church. I served as a pastor in my congregation for about 10 years. I've sat across the table from people who were — were out of work and worked with them to try and find new work or to help them through tough times. I went to the Olympics when they were in trouble to try and get them on track. And as governor of my state, I was able to get a hundred percent of my people insured — all my kids; about 98 percent of the adults. Was able also to get our schools ranked number one in the nation so a hundred percent of our kids would have a bright opportunity for a future. I understand that I can get this country on track again. We don't have to settle for what we're going through. We don't have to settle for gasoline at four bucks. We don't have to settle for unemployment at a — at a chronically high level. We don't have to settle for 47 million people on food stamps. We don't have to settle for 50 percent of kids coming out of college not able to get work. We don't have to settle for 23 million people struggling to find a good job. And — and that is part of what's at stake in this election. There's a fundamentally different vision about how we move our country forward. I believe Governor Romney is a good man. He loves his family, cares about his faith. But I also believe that when he said behind closed doors that 47 percent of the country considers themselves victims who refuse personal responsibility — think about who he was talking about: folks on Social Security who've worked all their lives, veterans who've sacrificed for this country, students who are out there trying to, hopefully, advance their own dreams, but also this country's dreams, soldiers who are overseas fighting for us right now, people who are working hard every day, paying payroll tax, gas taxes, but don't make enough income.